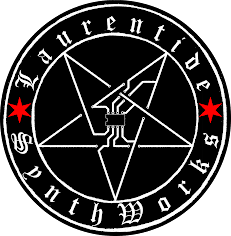 We have moved to www.laurentidesynthworks.net. This blog is no longer maintained. I've been beta testing the new set of MI modules the past couple months. Elements by far is my favorite. The others are amazing in their own right, but Elements is something special. Hook a Mikrophonie up to it and it becomes unworldly. Over the past 6-8 months I have been working on a Eurorack Module that will be rackless. These devices will be passive inline modules that plug between patch cables. Pocket Gate: Inline Passive Vactrol Gate. The Pocket Knob pretty much speaks for itself. Its just a knob with an IN and OUT jack for attenuating CV and Audio Signals. 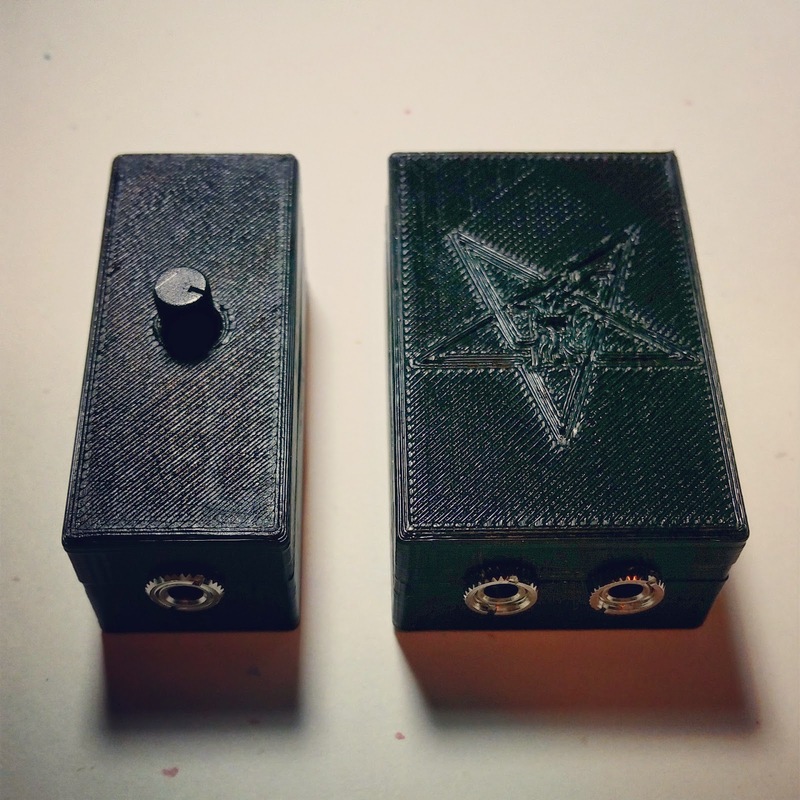 The Pocket Gate is a vactrol based passive VCA. Simply, a CV IN and an Audio IN and OUT. The CV in can be anything from a trigger, gate, Envelope, LFO, etc. to drive the Vactrol. Send your VCO or any other audio source through the IN & OUT and get VCA type effects. They will come in 2 flavors: Fast (Quick release time for percussive sounds). Slow (slower release better suited for sequenced patterns or larger, drawn out drum sounds). Currently the case design has been finalized. Next step is to have the cases made with injection molding (a much more daunting task than I had originally thought) and get the PCB's made. At this time I do not have an ETA, but if my foot was put on a block to be hobbled, I'd say by the end of the year or very beginning of next year. FYI, the picture below shows the 3D Printed Prototypes. The cases will look much nicer when complete and will be white with nice Lexan overlays. The logo will also look a lot more banging. Also, the shaft on the Attenuator will be changed to a standard D-Shaft so a knob can be added, giving much better control. This is just the 1st of a series of devices I plan on releasing in this form factor. I registered the domain laurentidesynthworks.net. Currently I have a friend working up the design of the site and am hoping to have it live within the next month. Most of the stuff here will be migrated over. I will be adding a "Store" where merch can be purchased. 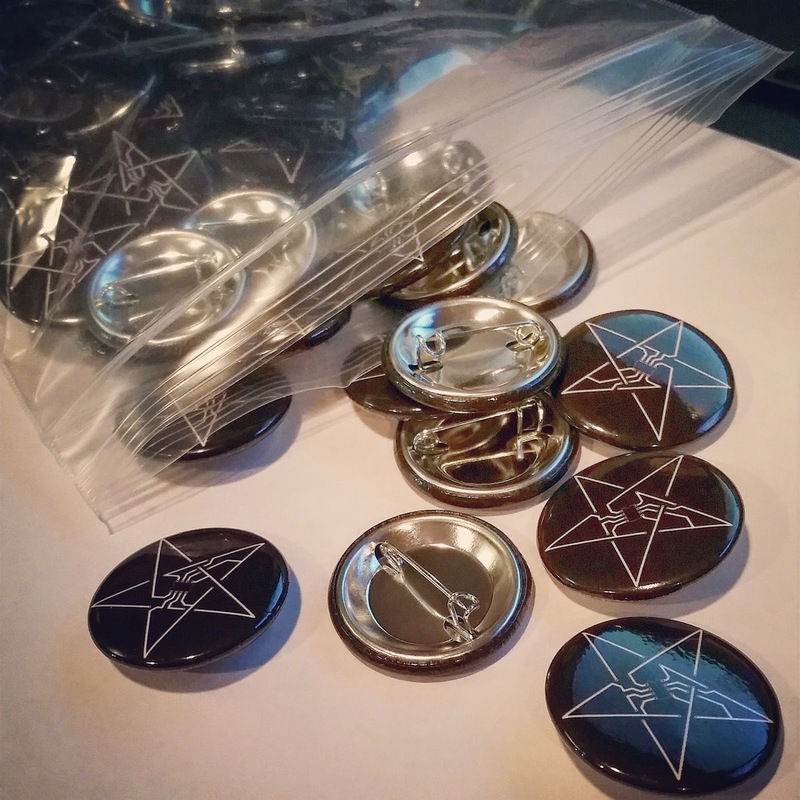 I have shirts and stickers on order and the buttons just arrived today. I'm also planning on pre-modding Werkstatt's to sell in the shop as well. Sometimes, I have to turn the soldering iron off and play! Laurentide SynthWorks 16 from Laurentide SynthWorks on Vimeo. Yesterday Mutable Instruments announced the demise of MIDIpal, Shruthi XT kits, All Shruthi filters except the SMR-4, Anushri & Ambika. In light of this I have procured a stash of Ambika Motherboards and all filter types. I will be able to accept build requests for Ambika for quite some time. Email me at laurentidesynthworks@gmail.com if you have any questions. Just spent the weekend at knobcon. This was the first time I attended and the first time I've taken LSW outside of my basement! Initially I was a bit overwhelmed, but once I got my table set up and started to meet people, the nerves settled. It was truly an amazing experience. I got a lot of positive feedback for the caseless module prototypes (more on these later) as well as the modded Werkstatt and TTSH. 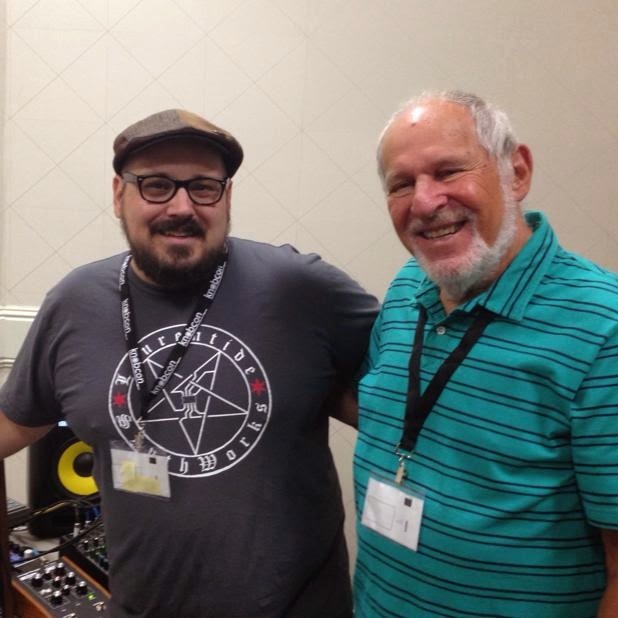 The highlight for me was meeting Herbert Deutsch and then having him asking me to take a photo with him! Seriously, what!?! Another great experience was all of the spontaneity. It was a lot of fun to walk up to a modular cranking away on a patch and then tweaking with it into another direction. Macro Machines table was right next to mine and at one point on Saturday we clocked our modulars together. I coulda done that for the rest of the night. As my day job, LSW and fatherly duties keep me occupied pretty much 24/7, I don't get to take my synths out. Finally having the opportunity to do this was spot on. It wasn't an easy decision to come to, but after much thought, I realized there was really no avoiding adding some knobs to the Werkstatt. It was really bugging me that I couldn't use the Werkstatt glide when using the EXP VCO IN, as the Glide is part of the keyboard which tracks 3V/Oct. It doesn't work will with 1V/Oct gear. The other thing was being unable to control the level of the VCO and the External IN. So, I added a glide and mixer circuit. It'll be a small PCB with SMD parts that'll fit right onto the kludge area. There's even enough room to solder in the MINICV PCB for some MIDI action! I'll be putting an order in for some of the PCB's and this will be a standard mod to be added to any Werkstatt's from here on out. I'll post the schematics and PCB files in the next couple of days as well. Laurentide SynthWorks 14 - Werkstatt Mod Walkthrough from Laurentide SynthWorks on Vimeo. Beheading synths since 2013 a.d.
MFOS Soundlab mini synth MKII. 2013 Laurentide Productions. Awesome Inc. theme. Powered by Blogger.